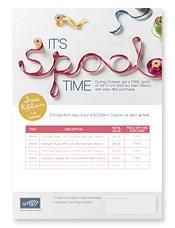 At Stampin’ Up!, it’s spool time! For the month of October, get a FREE package of 3/8″ (1 cm) Stitched Satin Ribbon-a $15.95 value-for every $60 you spend! Orders can be placed by phone, E-mail OR in person and can be delivered anywhere within Australia!